With a few lines on each page, this children’s book tells a story about how dinosaurs (aka kids) act as mom and dad attempt to put them to bed. 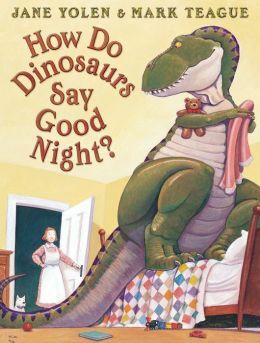 From throwing their covers around to moaning about bedtime, it’s a whimsical way to share how the dinosaurs gently go to sleep. They “give one kiss and turn off the light… and whisper goodnight” as the book comes to an end. I have read this book over and over with my kiddos. Our little guy is learning how to read so he was excited to read out it loud to his little sister. It was adorable plus a great way for both of them to learn word recognition and use their imagination. A great addition to your kids’ library if you have little dinosaurs or need a gift for one! When We Were Rock Stars! Great to hear from you 🙂 Thank you for the book suggestion! Isn’t it funny what they hook onto when it comes to books. This one sat for a while and now it’s a fave.